There was a time when rising enrollments at Georgia’s tech-nical colleges were as predictable as azaleas in the spring, climbing annually by double digits. But the onset of a fading economy in 2007 led to across-the-board budget cuts and other austerity measures, including significant changes made to the state’s HOPE Scholarship Program in 2011. A hike in the required minimum grade point average (GPA) from 2.0 to 3.0 meant many students lost their HOPE eligibility and forced 9,000 of them out of Technical College System schools. The technical colleges saw their enrollments decline rapidly, with 25,000 fewer students signing up for classes in 2012 than the year before. An improvement in the economy also contributed to the declining enrollment as more students left the classroom for the workplace. Austerity measures are beginning to soften as Georgia’s economic developers land projects that are creating more high-paying jobs, with the state’s technical colleges installing innovative training programs to create the workers needed for those jobs. From Athens to Valdosta, and across Middle Georgia through the Atlanta suburbs, technical colleges are forging alliances with local schools, businesses, industries and each other. They are generating millions in shared grant dollars, and at the same time dramatically changing the shape of education in the state. There is an understandable weariness in Ron Jackson’s voice these days. For the past several years, Jackson has been patching up holes in an ever more porous state budget. The most common remedy for Jackson’s budget tightening efforts has been the merger, the act of combining technical colleges that share a bit of common ground in their service areas. As the new year was beginning, Jackson was in the midst of what he believed would be the final merger. “I hope it will be the last one,” he says. “But budget constraints being what they are, I can’t guarantee that. Every one I’ve done recently I said was the last one, and I proved myself wrong every time.” Jackson says he expects a budget reduction from state funding of about $27 million, with perhaps a little help from some nimble creativity in the management of a few sources over which he has some measure of control. “We’ve increased our tuition, and that’ll help us a little bit,” Jackson says, but he is also relying on what he believes to be the greatest strength of the technical college system: relationships and partnerships. Individual technical colleges have partnerships with their local school systems and client businesses that hire them to perform customized training for their workers. Georgia’s 24 post-merger technical colleges have access to their own resources, from the companies for which they provide certain training courses and from federal, state, private and local grants. Athens Technical College is in line to be among the largest beneficiaries of recent federal grants, thanks to a 2012 $13.6-million grant from the U.S. Department of Labor. The school is the lead technical college in a three-college partnership with the Caterpillar company in training programs for the heavy equipment manufacturer and will receive a $9.6-million portion of the grant. Caterpillar has begun hiring for administrative positions, with 30 employees on the payroll, a modest beginning for what is expected to be 1,400 workers on board when the initial training period has been completed and the first products are coming off the line – by the end of this year. “We do have a lot of training [yet] to do,” Tydings says. “We’ve made a 10-year commitment to Caterpillar for the training center.” Nearby Madison County is expected to be a rich source for workers, a fact that stimulated a $3.65-million grant for a career academy to serve future workforce needs of Caterpillar, according to Tydings. Tydings and her Athens Tech team were just pausing to take a breath in August 2012 after launching the Caterpillar training when word came that California-based Baxter Inter-national Inc. planned to invest more than $1 billion in new facilities across several counties not far from the Caterpillar site near Athens, giving Athens Tech another training partner. The Baxter plant site, which will eventually employ 1,500 in the production of bio-pharmaceuticals and plasma, will include a warehouse and distribution center, in addition to lab technicians and administrative personnel. “We have about 33 companies in the Athens area that we’ve been supplying lab techs, so this is an area we’ve been accustomed to training in for quite some time,” Tydings says. “Both these projects [together] are huge, definitely right there with Kia. These two companies will change the workforce of Northeast Georgia once they reach full staffing.” They are already changing the nature of high school education. In the mix of training partners for Athens Tech, including Caterpillar and Baxter, is the Madison County School District, beneficiary of the $3.65 million to jumpstart a career academy in a partnership with Athens Tech to train future Caterpillar employees. The regional career academy also counts as partners the school systems of Clarke and Elbert counties. Such partnerships mark a trend in education and workforce training operating in tandem for high school students. There are 27 career academies across Georgia in partnership with technical colleges serving 28,000 students last year, with those figures representing 35 local school districts, according to Mark Whitlock, CEO of the Central Educational Center (CEC) in Newnan, a charter college and career academy that is itself a partnership with local businesses, Coweta County School System and West Georgia Technical College. Business and industry executives were asking the CEC if a way could be found to get high school students on track to possessing the technical skills at an age younger than 27, 27 being the average age of technical college enrollees. “Georgia businesses were saying, ‘We’d like younger people to have that level of maturity with technical skills,’” Whitlock says. One of those contractors is Northrop Grumman, a longtime contractor with the base. “We have a long history with them for aircraft maintenance and avionics training on Robins, where we’ve offered over 16,000 hours in training per year,” Allen says. Interest in the well-being of the base is intense in this part of the state, due in part to the 23,000 workers there who take home in excess of $1 billion in pay each year. The center would provide training and educational opportunities for the military and their families, as well as veterans coming back from war zones and seeking to re-enter the workforce, according to Jackson. For Jackson, the Air Force base is just one example of a new spirit of cooperation between the technical colleges and the university campuses. Dr. Ray Perren is president of Wire-grass Georgia Technical College, one of the products of a merger, and an institution that has partnered with Valdosta State University and South Georgia Medical Center to produce sorely needed nurses and other healthcare professionals for his college’s South Georgia region and the rest of the state. Perren is optimistic when discussing the future prospects for his campus and its students. Three years ago, Terry Elam, president of Augusta Technical College, received an offer he couldn’t refuse, to do something he’d never done before. “We were approached by Southern Nuclear [a division of the Southern Company], along with several other major nuclear plant owners in the Southeast, including Duke Power, about a nuclear technology program to train operators for the new nuclear reactors being built in South Carolina and, of course, at Plant Vogtle,” he recalls. “We saw it as a challenge because, obviously, it was something we had never done before.” In fact, Augusta Tech already had some assets in place that would fit nicely into a program designed to teach and train operators at the nuclear plant. After all, Plant Vogtle is only 30 miles from the school’s campus, and Augusta Tech was already teaching some basic courses necessary to the nuclear operator class. “At the same time, Southern Nuclear was setting up its own training facility in the Augusta area to train workers for reactors 3 and 4 now under construction,” Elam says. Faster than an atom in flight, Augusta Tech became a nuclear power in Georgia’s technical college system. A curriculum was developed to create nuclear operators who, after they finished their coursework with a two-year associate degree, could walk straight into jobs and starting salaries of $50,000 a year, according to Elam. The class of 2011 had 40 students, with about 23 of those hired by Plant Vogtle. “The next year we took 60 students, the group that is in school now, and we’re about to take our third class,” Elam says. 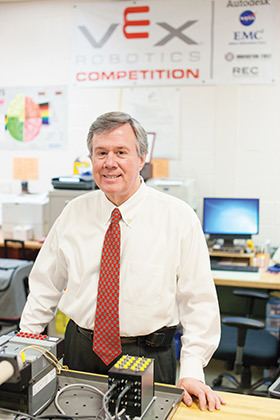 “There’s an internship at the plant, and one of the unique things about it is that at the first two classes they allowed their employees, [who are] subject-matter experts, to come to our classes, co-teach, observe the students and help them through the program.” Southern Nuc-lear has also chipped in with books and scholarships.